The quality action on the flat continues this week with the Newmarket July Meeting. Headlined by Saturday’s July Cup, this three day meeting contains a mixture of Group level races, ultra-competitive handicaps and races which pit together some of the most promising juveniles in training. The mix of racing in the July Meeting is great for punters. There’s a whole host of betting value to be unearthed throughout the meeting. So why not mark your card with tips from a selection of the best racing ahead of you? Ladies Day gets the July Meeting underway. That means a certain amount of style and fun in the stands while on the course there is an exciting selection of races for punters to get their teeth into. Two-year-olds have a few chances to shine during this week at Newmarket including in the Group 2 July Stakes. 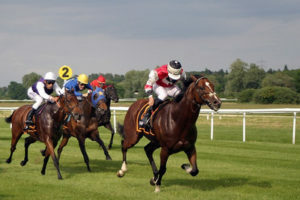 This six furlong contest will see some very promising types go up against each other but while juveniles can make quick improvements, punters have seen enough of the main protagonists in the July Stakes to give them something to go on. Advertise is the favourite with the bookies. He was a very impressive winner on his debut at Newbury and did well to finish second last time out at Ascot from a tricky draw. Martyn Meade’s colt has a good chance to win but it could be the horse who finished just behind him at Royal Ascot, Sergei Prokofiev, who gets up to triumph. Trained by Aidan O’Brien, Sergei Prokofiev was never going to win the Coventry Stakes after Ryan Moore was forced to switch twice to try and give the horse a route to the line. Hopes are high that this colt has a big future ahead of him and providing things go a little smoother for him in running Sergei Prokofiev may just reward his backers at 9/2 with Betfair. The first of a few Bet365 Handicaps of the week, this is a class two handicap race open to three-year-olds and run over a distance of just six furlongs. A maximum of 20 horses can compete and the decent prize on offer has seen the 2018 renewal oversubscribed. When the cut is made we’ll be left with a competitive field which offers some great betting options. As this race has been going for a while there are some trends that punters can use to inform their betting. For example, none of the last 12 winners won their most recent race, they all raced within the last four weeks and the vast majority had at least one win over six furlongs before. One horse who ticks all of those boxes is the Andrew Balding trained, Foxtrot Lady. It’s been a fairly busy season for Foxtrot Lady already with five appearances over six furlongs on the turf so far. Those appearances have yielded two wins and two second places and Balding is very happy with the work of his filly. Despite those strong performances, Foxtrot Lady has been well treated by the handicapper and will run off a mark of 8-10 so represents good value at 10/1 with Ladbrokes. We’re at the stage of the flat racing season when members of the Classic generation begin to compete against their elders. That’s the case in the Princess of Wales’s Stakes which is open to horses aged three and older. Run over one mile, four furlongs, this is a Group 2 race which is set to be contested by some quality horses from well-respected yards. Mirage Dancer is the bookies’ favourite having secured some decent results so far but the value bet could well be Dee Ex Bee. Mark Jonhston’s three-year-old was a rather surprising second in the Epsom Derby but was very disappointing when finishing towards the back of the pack in Irish equivalent. The ride Dee Ex Bee got that day at the Curragh was questioned as he was held towards the back and couldn’t get back on terms at any stage. A drop down in grade could see Dee Ex Bee get back to winning ways at a generous 7/2 with Betfair. It’s all about feeling good on Friday at Newmarket. The organisers do a great job of keeping racegoers entertained between races but punters may be a little worried about having a bet on Friday the 13th! The Duchess of Cambridge Stakes has been a Group 2 race since 1996. Even before that promotion, this was an important race for two-year-old fillies who have been slated for big things in their future. We certainly have some exciting types in the betting for the 2018 renewal. The most interesting option in Friday’s race is Just Wonderful. Aidan O’Brien was shocked with her performance in the Group 3 Albany Stakes at Royal Ascot and the vet could find no obvious reason why she would follow up a debut win at the Curragh by finishing 14th of 18. The only viable excuses for Just Wonderful is that she was held up in traffic at Ascot and that the performances of two-year-olds are often very difficult to predict. Just Wonderful is one of those fillies who punters with a keen interest in breeding have been getting very excited about. Connections are hopeful that she will be a main player in the big middle distance races next year but for now the job is about getting back to being competitive again when up against quality rivals. Backing Just Wonderful after such a stunning failure carries some risk but she does look good value for an each way bet at 10/1 with Ladbrokes. The Falmouth Stakes is one of two Group 1 races at the Newmarket July Meeting. This is a chance for the best filly and mare milers to show what they are capable of against their elders. After a run of five straight wins for four-year-olds, it was members of the Classic generation who won the most recent two renewals and it’s another three-year-old, Alpha Centauri, who heads the betting. Rhododendron and Hydrangea were two of the stars of last year’s Classic generation and of the pair, it’s Rhododendron who has the best chance of winning despite a flat performance last time out in the Queen Anne Stakes. It’s unlikely that she’ll be able to get the better of the bookies’ favourite though. Jessica Harrington was more than a little disappointed with Alpha Centauri’s first performance of the season but all was forgiven thanks to consecutive Group 1 wins. Her showing at Royal Ascot was particularly impressive, winning the Coronation Stakes in record time. A repeat of that performance will make her unbeatable at Newmarket but she’s far from unbackable at 8/11 with Betfred. Saturday brings the July Meeting to a close with a bang. Named after the feature race of the day, Darley July Cup day includes some very competitive handicaps and chances for two-year-olds to show what they can do in addition to the Group 1 which takes all the attention. The Bunbury Cup is a very popular race for a variety of reasons. For punters, this seven furlong contest with 20 competitors always throws up some very tempting bets while trainers and connections are enthused by the prospect of claiming the £75,000 prize given to the winner. Although this is a very difficult race to predict, get it right and there is some big profit to be made. The bookies may not be clear about who to fear most (Gilgamesh is a weak favourite at a general 7/1), but Speculative Bid is one who could return very nicely from an each way bet at 25/1 with Coral. At seven, Speculative Bid would be the oldest winner of the Bunbury Cup since Mine in 2008 but David Elsworth’s gelding is fresher than many horses his age having missed the 2016 season through injury. Following some good performances over the winter, hopes are high that Speculative Bid can get back to the levels he reached pre injury. A win would be a massive result on his first turf performance of the year but it is not out of the question while just a place would see Speculative Bid return nicely for his backers. This is the race upon which the Newmarket July Meeting hangs its hat. Run over six furlongs, the Group 1 July Cup is among the most valuable and prestigious sprints of the flat racing season. Winning this race always improves a horse’s reputation and it’s going to take an excellent display of sprinting to come out on top of the high class field assembled on Saturday. Blue Point, U S Navy Flag and Eqtidaar are all from well-respected yards and all three have been well backed in the earlier stages of the betting. Those three clearly have a good chance of landing the July Cup but a win for Dreamfield would be the biggest story. The Godolphin-owned colt made waves as a two-year-old, winning both of his starts (including Conditions Stakes at Newmarket in October). However, injury kept him out of the entirety of 2017 so Dreamfield is remains inexperienced for a four-year-old. That inexperience was in evidence when he hung left last time out at Royal Ascot. Other than that error under pressure, John Gosden will be happy with Dreamfield’s showing in front of the huge crowds at Ascot. It’s clear from the 10/1 price that Betfair are quoting that the bookies are unconvinced but Dreamfield has all the attributes to go on and become a top class sprinter so don’t rule out an eye catching July Cup win. One of the real sporting highlights of the summer months is the plethora of flat racing festivals on offer. No sooner is one over and done, than another seems to be on the horizon. From Royal Ascot to Glorious Goodwood, from Chester to York, racing is the sport which just keeps on giving over the summer months, with top class action all over the country. It is the course of Newmarket which is the spiritual and organisational home of the flat racing game though, and as such it is only fitting that the Suffolk venue throws its hat into the ring with a top class festival of its own. Held in mid-July each year and taking place on the July course at HQ, this three-day meeting lays on 21 contests for our viewing and punting pleasure. With seven Group races in all, including two at the very highest level, intermixed with high quality handicapping and juvenile action, this is one summer racing show that is definitely not to be missed. Here we take a look at this excellent meeting’s flagship contests to get your racing juices flowing. This is the July Meeting, held on the July Course and it is the July Cup which fittingly acts as the headline act across the three days. Part of the British Champion Series, this prestigious Group 1 affair, a six furlong sprint, annually attracts the real superstars of the sprinting game, who line up to do battle for the £500,000 in total prize money on offer. Open to all runners aged three and older, be they fillies, geldings or colts, this contest really does determine who is the fastest of them all. Diadem, Abernant and Right Boy all have their names in the sprinting hall of fame, and all won this race twice. Sundridge bettered those achievement though when landing three successive editions between 1902 and 1904. The names of Oasis Dream, Muhaarar and Harry Angel feature prominently on the list of champions from the current century, in what is a high class roll of honour. Taking centre stage on the opening day is this 1m4f Group 2 event open to all runners aged three and older. Named in honour of Alexandra of Denmark who became Princess Of Wales back in 1863, this race was added to the Newmarket offering in 1892 and quickly became established as one of the summer’s top targets for the middle distance performers. Initially held over the one mile trip, both the distance and prize money have increased over the years, with a more than tidy purse of £100,000 on offer in 2018. Sir Michael Stoute seems to have a particular affinity with this race having recorded a hugely impressive nine wins as of 2018, putting him out in front in the training ranks. This race has also been the scene of a returning hero on a few occasions over the years, with Lance Chest, Primera, Lomond, Millenary and more recently the ever popular Big Orange all winning back to back editions. The juvenile fillies provide the chief supporting act on Day 2 in this Group 2 contest held over the straight 6f. With £80,000 (2018) up for grabs this event regularly attracts the speediest and most promising fillies in the game. Initially known as the Cherry Hinton Stakes, the race was renamed in honour of Catherine, Duchess of Cambridge, in 2013. The top trainers in the game tend to target the stars of their fillies strings at this event, with previous winners of the race often going on to achieve great things. Sweet Solera was good enough both to go on and win the subsequent season’s 1000 Guineas and then even have a race named in her honour. Another to achieve Classic success was the Mark Johnston-trained splay-legged wonder, Attraction, who landed the 2003 edition of this. The first Group 1 contest of the meeting sees the fillies aged three and older line up for this one mile long event which acts as the centrepiece to the Day 2 card. Named in honour of the 6th Viscount Falmouth, who counted horse racing amongst her chief interests, the contest offers £200,000 (2018) in total prize money, and regularly attracts a star studded field. The tough and talented Soviet Song and Sir Michael Stoute’s Sonic Lady are the only dual winners of the race as of 2018, with the brilliant duo of Goldikova and Alpha Centauri two others to feature prominently on the list of former heroines. It’s not all about the Group class action at Newmarket in July though, with one of the many attractions of this meeting being the quality and range of the handicaps on offer. The pick of those for us is the historic Bunbury Cup. Taking place on the closing day, this fiercely competitive Class 2 7f event is open to all runners aged three and over. Not always an easy one to call, it does often throw up some winners at tasty odds, rewarding those who manage to unpick the tricky puzzle of this race. The stamina laden three year olds take to the track in this contest which acts as one of the highlights on the opening day. 1m5f is the trip for this Group 3 affair which offers £150,000 (2018) prize money. Three time Arc runner up, Youmzain, St.Leger hero, Masked Marvel and the hugely popular Persian Punch all feature on the roll of honour. The meeting’s top contest for the juvenile colts regularly kicks off the action on the final day. Taking place over the 7f trip, this Group 2 event generally sees a field of Classic aspirants going to post. Won by the likes of Derby winner, Dr. Devious, and one of the greatest stallions of modern times, Dubawi, this is a race well worth keeping an eye on. There’s certainly no shortage of high class two year old action at this meeting, with this Group 2 6f event held on the opening day representing another chance for the youngsters to showcase their talents. Having first been run in 1786, this is actually the oldest two year old contest run anywhere in the world. The speedy 1985 winner Green Desert is the standout amongst the list of previous winners, both for his exploits at the track and subsequently as a stallion, with many of his progeny, including Cape Cross and Desert Prince going on to great things. There are few – if any – racing venues that are quite so steeped in history as Newmarket. Harking all the way back to 1667, when the track acted as the venue for match races between the nobles, it wasn’t long before the Suffolk course soon became the epicentre of the flat racing world. It was close to a hundred years after those first knockings of racing at the track that this meeting came into being in 1765. Initially a two day affair, the popularity and quality of the festival continued to grow in subsequent years, which saw a number of the contests we know and love to this day join the party. Firstly we saw the July Stakes added in 1786, with the July Cup itself following in 1876. The names of the other races here are littered with significant figures from racing’s gilded past, none more so than that of Sir Charles Bunbury. Bunbury was the man behind both the 1000 and 2000 Guineas held at this track, and also played a significant role in the introduction of the Derby itself. Indeed – but for a lost coin toss – the Derby – and all other Derby’s held around the world – would likely have been known as the Bunbury. The Kentucky Bunbury anyone? It’s safe to say things have come a long way from those initial £100 match races held at the course, with the event now encompassing three days, and offering in excess of £1.2million in total prize money. Now well into its fourth century – how many sporting events can say that? – this excellent meeting is showing no signs of slowing down just yet.